Clinton: “a taco truck on every corner sounds absolutely delicious"
The Democratic candidate joked about controversial statements made by a Trump supporter and campaigned with President Obama in front of thousands of Hispanics gathered in Washington. 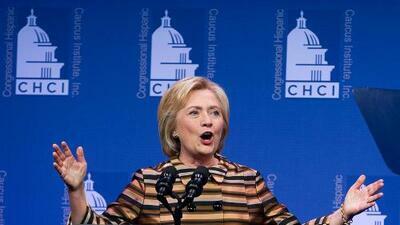 WASHINGTON D.C - Hillary Clinton and President Barack Obama addressed the Congressional Hispanic Caucus Institute annual gala on Thursday night seeking to extend the historic support of Latino voters for the Democratic Party. The annual event celebrates Hispanic Heritage month, bringing together political, business and civic leaders to highlight outstanding achievements. With less than 60 days before the election it was also an opportunity for the Democratic candidate and the president to reach out once more to Hispanics, a crucial voting bloc in several key swing states. With polls showing an increasingly tight race between the Democratic candidate and Republican rival Donald Trump, many analysts are pointing to Latino turnout - a historic weakness - as potentially key to Clinton’s chances of victory. Obama, attending the forum for the last time as president, took the opportunity to highlight some of his most important measures over the last eight years, including greater access to healthcare through Obamacare and thawed relations between the United States and Cuba. "Health is not a privilege but a right for all," he said to applause before highlighting that "4 million Hispanic Americans" are insured under the plan. The president also made reference to Trump’s proposed border wall. "Immigrants are not criminals or rapists, but people who come here to work for a better life," he said. Mexican Senator Zoé Robledo, who came from Chiapas state for the event, told Univision that despite millions of deportations during his administration, Obama was still a friend of the Hispanic community. "We need better laws for migrants in the US and in Mexico," he acknowledged. Obama has deported more immigrants than any other president in the history of the United States: around 2.8 million. Of them, more than 40% of deportees did not have criminal backgrounds. In one of her first public appearances after a three day break due to pneumonia, Clinton confirmed her previously stated commitment to comprehensive immigration reform in the first 100 days, if elected. She also reaffirmed his promises to invest in job creation and support for small businesses. The tone of the event was more sympathetic to Clinton compared to last year when she was interrupted by an immigration activist who criticized her campaign donations by companies that manage immigration detention centers. On Thursday Clinton was applauded when she promised to end "private detention centers" in addition to ending "family detention" and immigration enforcement "raids." Clinton also handed out a prize to the Spanish chef José Andrés, currently embroiled in a lawsuit with Donald Trump for backing out of a restaurant deal at a Trump hotel due to the candidate’s inflammatory rhetoric magnate. "This is a turning point not only for Latinos but for our country," she said with a serious tone that cut the festive atmosphere. "When you hear a presidential candidate to launch a hate speech that divides, it is easy to get discouraged," she said. In the most emotional moment of the night, Clinton told the story of a young Dreamer who was granted citizenship posthumously after he joined the U.S. Army and died in Iraq. Clinton said one of the young man’s teachers wrote to her to point out that despite what Donald Trump says, ”immigrants are not criminals or rapists." She referred to the Republican candidate in blunt terms: "We must reject this rhetoric that divides and stop it once and for all in November," she said raising her voice. That comment was in reference to controversial statements by Marco Gutierrez, co-founder of Latinos for Trump, who recently warned of the risks of “dominant” Latino culture would result in taco trucks on “every corner” of the country. Even though Clinton did not have a lot new in her speech, mostly echoing a July speech to the League of United Latin American Citizens (LULAC), some saw that as a plus. "Less than 60 days before the election, Clinton remains consistent which is very important," said the veteran civil rights activist,” said Ben Monterroso, of the pro-immigrant group Mi Familia Vota.